PhotoDirector 10 is one of the reference software in the world of digital photography. Used by professionals, PhotoDirector 10 is now accessible to everyone thanks to its intuitive interface and numerous easy-to-access editing features. Thanks to it you can enjoy quality photos in a few simple steps. For example, you can reduce noise, play with the texture of the images, adjust brightness and colors. Extremely powerful, this software includes the "lens correction" option which automatically eliminates distortions. 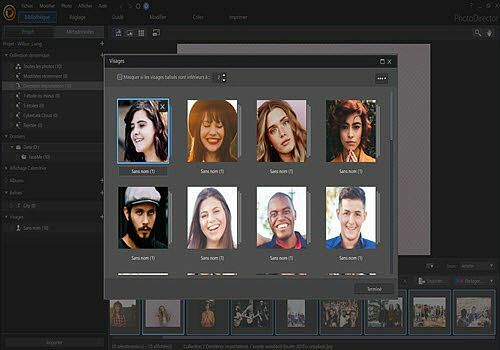 But the big strength of PhotoDirector 10 is all these photo personalization tools that help you turn ordinary photos into real masterpieces. This makes it possible to create beautiful panoramas, remove an element from the photo without damaging it, perform HDR fusions and many creative compositions. Finally, with PhotoDirector 10 no more photos will be missed. Indeed, thanks to its Face Swap function, the software recomposes a photo with only smiling faces. Similarly, the skin beautician offers perfect portraits, without wrinkles or pimples in the middle of the forehead.